Returning to the US from St. Maarten. First of all our flight was delayed 2 hrs so we only had 45 mins to connect. 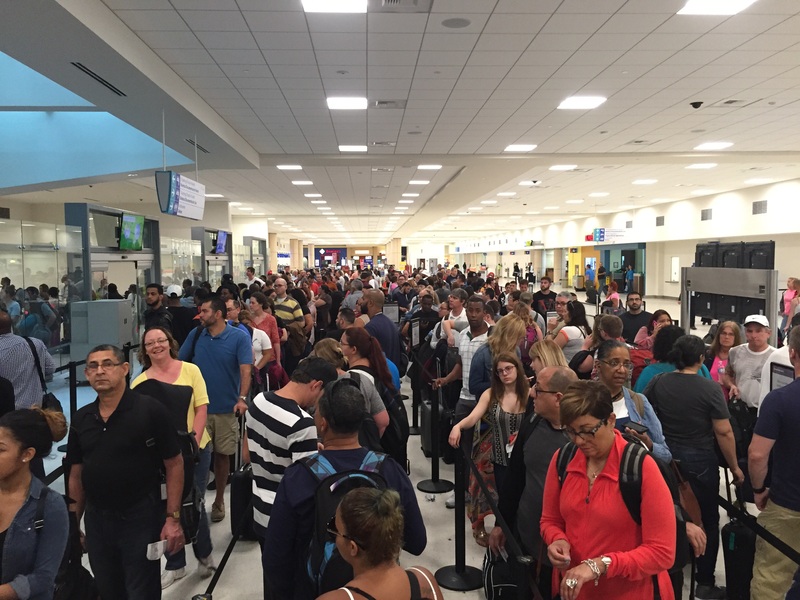 We have been flying international for 20 years and never had the delays lines disorganization that we had to go thru in San Juan. First a line for the Custom Check then collect our baggage then another line for another custom check. Walk 10 minutes to the connecting terminal to stand in line to re-check our baggage personally with the ticket counter (even though it was originally tagged/checked all the way through to our final destination) then one more TSA check get rid of all liquids. OK fine now if you wanted a bottle of water to take with you there was not one place to purchase it just run to your gate to be informed that we were late and they were kind enough to hold the door for us. My wife and I were travelling from Beef Island in the British Virgin Islands to New York JFK and had to change at San Juan. Flight into San Juan had been delayed by 2 hours and we were now in a position of missing our connection. Beef Island phoned ahead and San Juan airport had promised us all that a member of airport staff would see the 20 passengers through the check point etc. They also said not to worry about collecting bags because our bags would be transferred for us. Arrived at San Juan with 45 minutes until our connection told we aren't allowed off the aircraft. Held on the plane for 15 minutes. 20 passengers all with connections to make locked outside the airport. We then sprint to passport control and it takes 4 checkouts 10 minutes to see my wife and I. With 15 minutes left informed that because of a mix up our bags were not sent to our next flight. We had to run back to collect them. By the time we arrived at the counter our flight had departed. The checkout man then had the cheek to ask us why we only left 45 minutes to make our connection. We were informed by 5 different staff members that this means we would be 1st to get a seat on the next flight. This wasn't the case though. Given boarding passes for a 17.45 flight direct to JFK gate 8 we were on the system for gate 9 to Miami at 17.25 (this was the 1st we'd heard of this). We could catch a connection from there. So with 10 minutes to spare off we run to gate 9 to explain the situation. Gate 8 phoned gate 9 and it turned out yes we were meant to be on that flight. By the time we finally we arrived at our hotel in New York we'd been travelling for almost 14 hours. Horribly disorganized! No instruction as to which lines/areas you should be in - in what order - awful. After standing in a long line for 20 minutes waiting for luggage tags I was told that I had to have a boarding pass first. There was no instruction and no signage near the baggage line. Back out of line - wait 15 minutes in boarding pass line - then back to luggage tag line. Just when I thought I was finished - back in line dragging the suitcase that they had already been tagged to yet another counter. It was ridiculous. The airport employees are no help and appear to be more interested in socializing with each other. I will think long and hard before booking anymore trips that will take me through this airport. The timing of flights is good service is friendly although not always fast. Usually crowded especially during 11-3 pm when many flights leave and 5-7 when many arrive. Needs more food options more store options and cleaner bathrooms. This is my home airport so it's easy to travel through here but connecting throughout the terminals is sometimes confusing. TSA is usually full mostly in terminal C check-in is very crowded too because it's really nearby USDA is very smooth travelling so is Immigration. YYZ-SJU-EIS return. Does its best but is clearly well above its design capacity in terms of passenger volumes. Check-in is hampered by too little space between counters and the exit which results in chaotic snaking queues and no free space. This is particularly trying during cruise ship changeovers when passenger volumes are highest. Security screening is passable with fairly efficient staff. Airside services are ok for the Caribbean but there is little available space for seating in the waiting lounges. Clearing US customs here is easy as it is mostly small planes feeding in passengers. San Juan's principal advantage is the number of direct flights from North America and the extensive connections provided by local airlines like American Eagle Cape Air and Fly BVI. YYZ to SJU return. Second visit to Luis Munoz Airport first time 3 years ago. My experience has not improved. Clean good maintenance and reasonably spacious however the electronic board with flight information is a complete joke. Only a small fraction of flights are listed and most without gate information. The only way is to walk around the terminal looking out the windows to find an Air Canada plane - totally unacceptable! Three years ago my US Air flight was cancelled but never indicated on the board. No Wifi - not even available for purchase. No Star Alliance Lounge. I was told by check-in counter that Continental had one but since its merger with United the lounge closed! Food choice limited and very expensive. Lineups at security long and chaotic. I was refused the Priority Line as a Star Alliance Gold member and was only grudgingly accepted when I pointed out my travelling companion was using a cane. Very incompetent and poorly trained ground staff. It's hard to avoid SJU if you go to southern Caribbean but I will try hard to avoid it in the future! The international airport is huge: the largest I'd guess of all those on Caribbean islands. It is immaculately clean. There are many dining and shopping options. Check-in (US Airways Business/First) was a breeze. Getting through security was a nightmare: long long lines inched toward the TSA stations at all four concourse entrances it took us over 20 mins in the early evening. Today was my third time flying into San Juan but the first time I ever had to connect to another airline. I found everything shutting down at 5pm - restaurants shops security even ticket counters! It seems to run on "island time." The layout is awkward and not labeled well with signs. My favorite part is how the terminals list the gate numbers but not the airlines serviced. And don't count on using the arrival and departure screens to locate or confirm your gate. Only about a third of the flights have an actual gate listed. When I return to the Caribbean I will do my best to avoid San Juan. 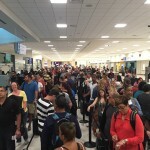 Airport offers good facilities for the Caribbean. Acceptable air-conditioning clean terminal and loos. Spacious terminals with plenty to eat (although for authentic Puerto Rican food dine before security). Staff is friendly and professional and there are plenty of reasonably- priced taxis to San Juan and the surrounding areas. All in all a pleasant experience and a good first impression to the visitor of this magnificent destination. Flew into San Juan this past summer from JFK for my honeymoon. Had no problems. We landed and the baggage claim was not a long walk and in a matter of 15 minutes I was my wife and I were in the taxi going to the hotel. Returning was even easier.